With the fanfare of a hard cough, the Federal Reserve released new new $100 Federal Reserve Notes on Tuesday, October 8, 2013 in the middle of the government shutdown. The launch is three years in the making following of folding problems during production at the Bureau of Engraving and Printing. Earlier on 2013, a Freedom of Information request forced the government to release information as to the problems the BEP was experiencing. The BEP released images along with the report (OIG-12-038 [PDF]) from the Treasury Office of the Inspector General heavily criticizing the BEP for mismanaging the delay. The published response from the BEP was to apologize promising to do better. As the U.S. Secret Service, Bureau of Engraving and Printing, and Federal Reserve scramble to deal with paper currency, some countries are abandoning cotton rag bond paper for polymer notes. The polymer “paper” was developed by the Reserve Bank of Australia to enhance the durability of the notes and to incorporate security features not possible with paper or rag-based paper. RBA has been distributing polymer notes since 1992. While the polymer substrate costs little more and the production is only marginally more expensive, the benefit will come from the reduction in counterfeiting and the durability of the note. Polymer will last three-to-six times longer than rag-based paper. While the United States has been struggling to fix the problems with paper, Canada has been releasing notes printed on polymer “paper.” The Bank of Canada announced in 2010 that they will be converting their banknotes from paper to using the polymer substrate. The Bank of Canada began issuing new C$100 notes in November 2011 made using polymer. Polymer C$50 and C$20 notes were issued in 2012. This past year, the Bank of Canada issued C$10, and C$5 polymer notes. Although there have been problems with the higher circulation $5 and $10 notes, the Bank of Canada considers the rollout a success. It may be one reason why the Bank of Canada may be considering a move to a $5 coin to replace the note. The Bank of England announced that they were going to transition to polymer currency notes. The research performed by the Bank of England can be used as a basis for the Federal Reserve to begin its own study. Although polymer notes may be a better idea, the BEP’s long time ties to Crane & Co. along with politics from Massachusetts will prevent the United States from considering polymer as a viable option. Ironically, there is an indication that the prices of the paper may not be as low as possible. After many yeas of Crand & Co. saying that they are heavy recyclers of cotton, specifically cotton from old denim jeans, we learned that Crane has been sourcing cotton from “beyond the waste stream.” In other words, no more blue jean recycling. Crane claims the problem is skinny jeans—the pants that many of us should not be wearing! In order to make the clothes tight but comfortable, manufacturers are adding spandex to the fabric so they appear tighter. Spandex and other synthetic fibers cannot be used to make currency because it degrades the strength of the paper. The process to remove the spandex or other “contaminants” is too expensive to be viable. The United States has tried to use non-paper for currency in the past. In the 1980s, the American Banknote Company worked to Dupont to use its Tyvek polyethylene fiber sheets for currency. Tyvek has had a lot of uses including liners used around insulation during construction and envelopes. It is a strong material that can last much longer than paper. After a number of problems, use of Tyvek was discontinued. As with the dollar coin, the long memory of the Tyvek failure is a significant detractor to the possibility of just researching the possible move. To paraphrase Thomas Edison, we did not fail in producing currency with plastic, we learned ways of how not to do it! It appears to be unlikely that the United States will be producing polymer notes any time soon. Last week I went to my local bank asking if they could order the new $100 note from the Federal Reserve. Following two currency deliveries I was told that the notes were not available in the supply chain that supplies my bank in the Maryland suburbs of Washington, DC. Another order was placed with the hopes that they will be available before the end of this year. Information from the Bureau of Engraving and Printing as to how to use the new note’s security features to ensure it is not a counterfeit. 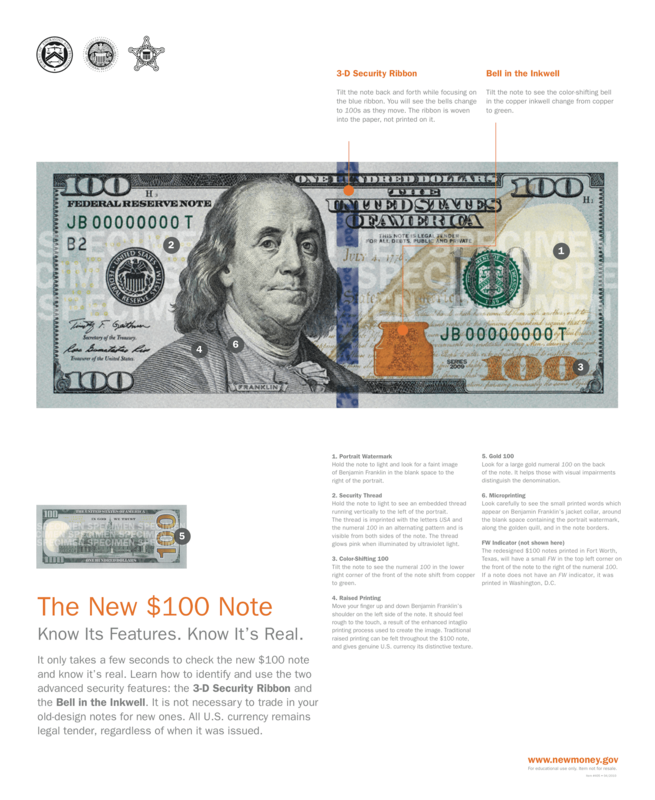 Image of new $100 note and counterfeit detection info courtesy of the Bureau of Engraving and Printing. Image of the Canadian $5 polymer note courtesy of the Bank of Canada.